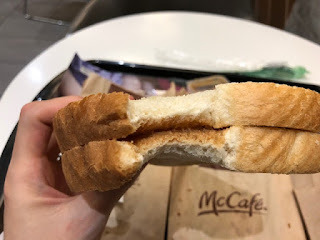 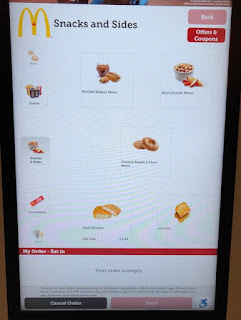 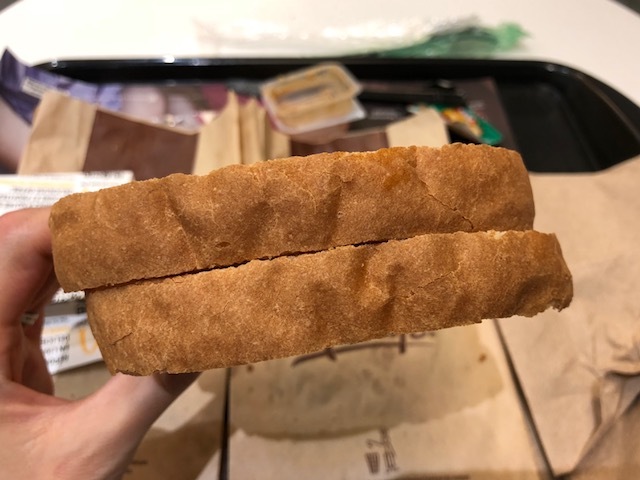 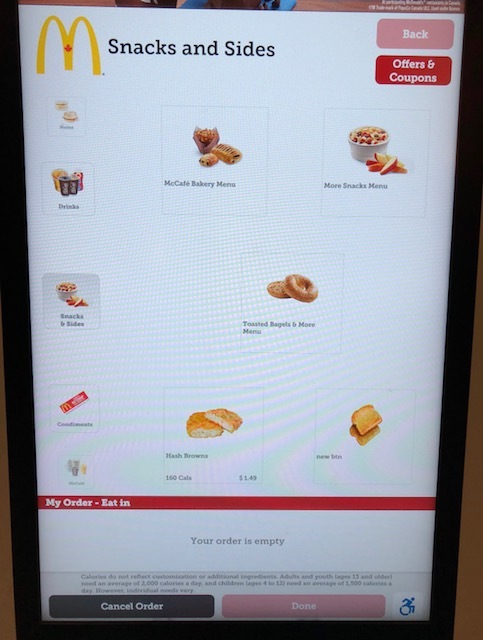 I was looking for if there's anything new at McDonald's Canada, and I found in Quebec only, they have toasts during breakfast time at participating locations. 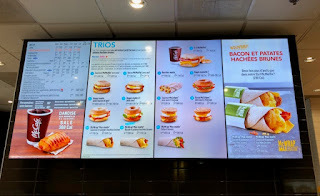 Sometimes ordering in English in Quebec cause confusion and we didn't get correct items, so I decided to use a machine to be safe. 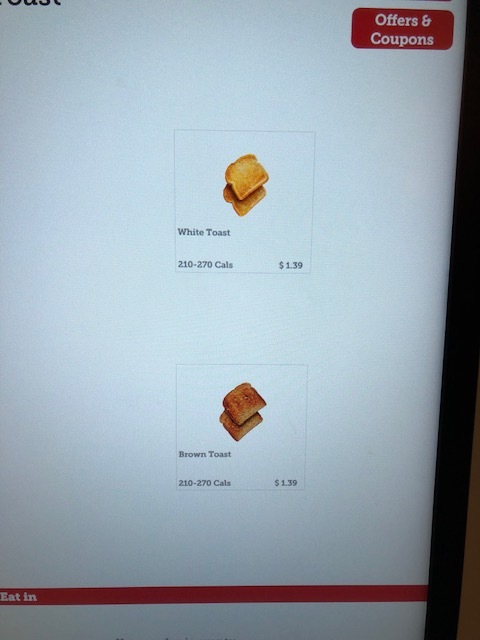 The bread was in "Snacks and Sides" section. 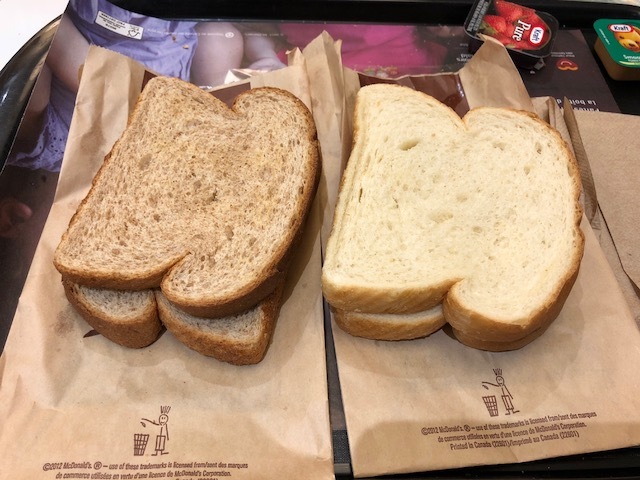 There're 2 kinds of bread; white or brown (wholegrain). For each toast, I could choose peanut butter, strawberry jam or no jam at all. 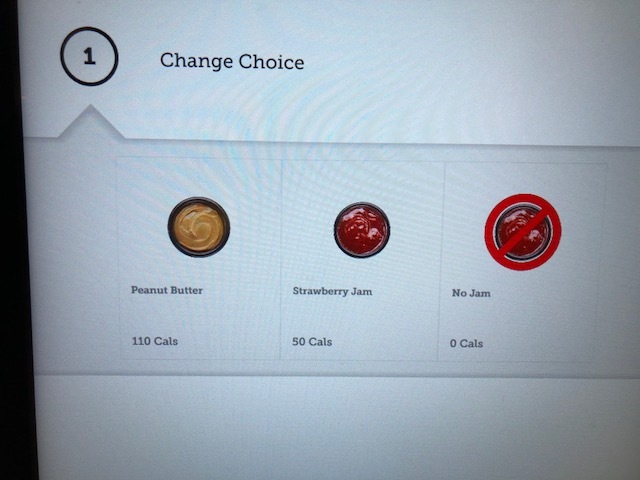 Not only when choosing the items, but also when checking the cart, the calories were shown. 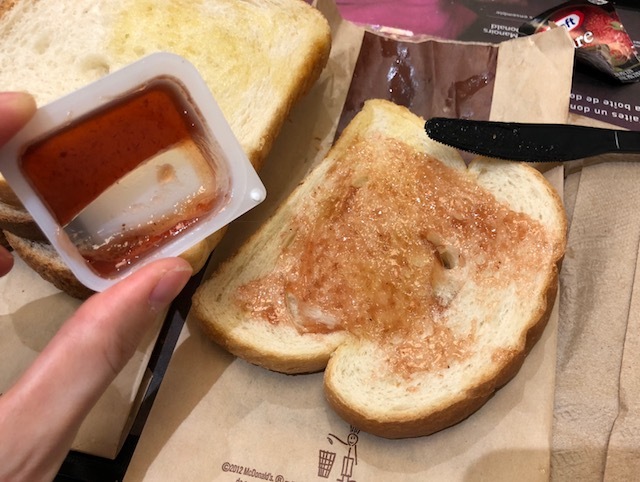 For white toast, I got peanut butter and for brown toast, I got strawberry jam. 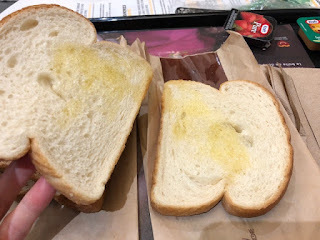 While waiting the toasts, I took a photo of the menu and one of the staffs said no photo, which was first time to be told ever here. 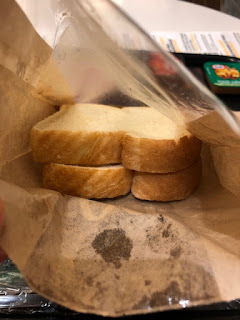 Toasts were in the same bags that they use for baked goods. 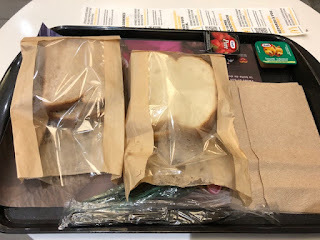 As the toasts were warm, both bags were most inside and the plastic side was foggy. 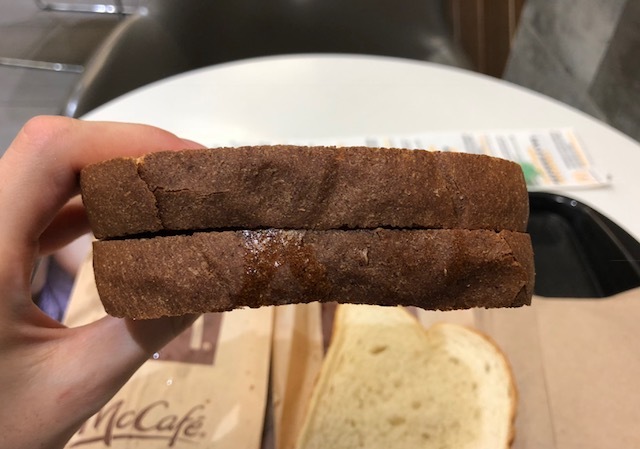 Between the brown toasts, they just roughly splashed margarin-alike liquid. White toasts had the same yellow liquid. If they put so casually, I think it's better not to have anything on. 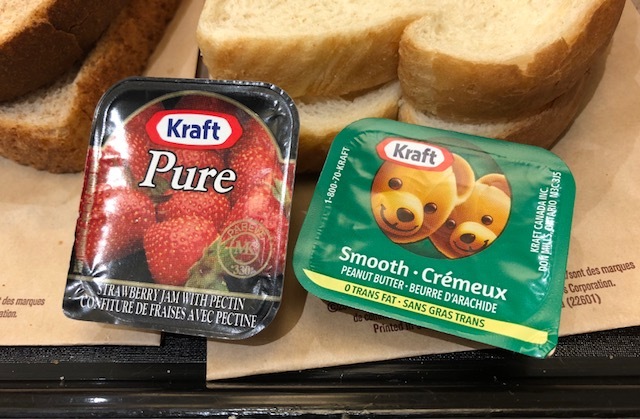 Strawberry jam and peanut butter were both Kraft. 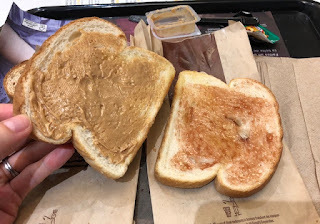 I was planning to make PB&J on each toast, and I spread a half of the jam. Both peanut butter and strawberry jam were smooth without any chunks, it's easy to spread with a plastic knife. 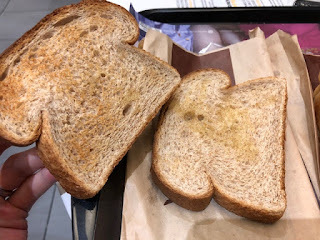 The surface was lightly crispy and warm and the inside was moist, but it's not really "toasted" the way I wished; medium brown with crispier surface and makes "crunch" noise when I bite. 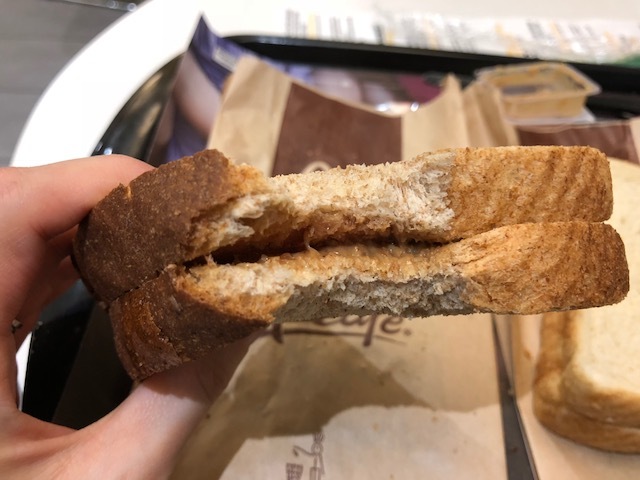 The texture was same as Brown Toast. 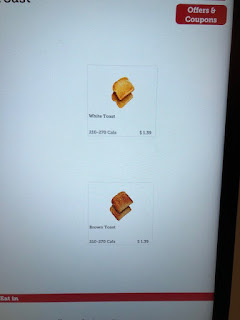 I think it's a good deal that you can get 2 slices of toast for 1.39 dollars with jam. If the portions of the jam and peanut butter were more, it'd be great and also I wish they hadn't put that mysterious oil on the toast. 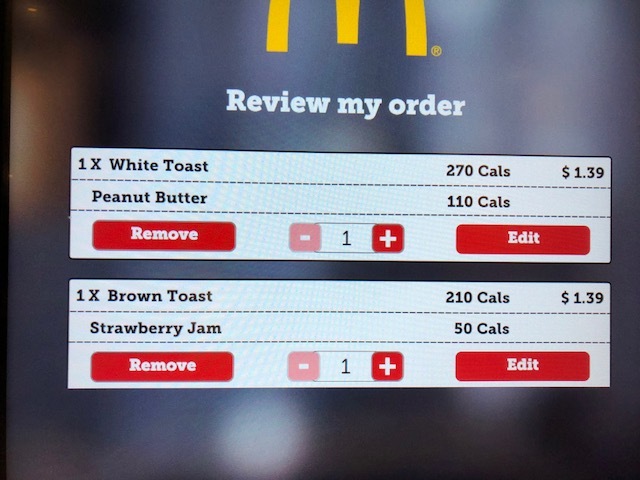 I'd like them to make options "Don't put anything on the toast" and "butter" also.